Heard of this… on an average 2,000 kids are reported missing every year, but only half of them are found, reveal statistics. ‘Missing’ includes those who have been kidnapped, lost or run away. See report in Hindustan Times and Times of India. In 2006, of the 1,569 kids who went missing, 582 were traced. In 2007, 4,000 children went missing in Mumbai, only 831 were traced – 3,169 kids have still not been located. 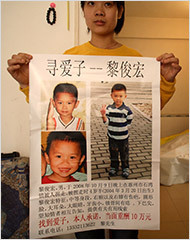 In 2008 only 2,837 cases of children who went missing. In a City of 18 million people, bubbling with life, business, glamour and decay, 2000 may not be much. Most of them never get ‘found’ and lost forever. Think about nearly 2000 families have to live with such incidents for rest of their lives.This is the dark side of slumdog millionaire city. Call it the Slumdog Paradox. Oscar winning movie Slumdog Millionaire might have changed the lives of Rubina, Tanvi, Ashutosh, Ayush and many others, but numerous children like them in the slums of Mumbai are still awaiting a change in their destiny. The number of mobile devices worldwide has surpassed 3.3 billion–roughly half of the world’s population. In Japan and several other countries, more people access the Web through mobile devices than fixed PCs. Several countries, including the United Kingdom, now have more mobile phones than people. There are over 500 million active mobile phone accounts in China, as compared to 275 million in India by the end of 2007. Luxembourg has the highest mobile phone penetration rate in the world, at 164% in December 2001. In Hong Kong the penetration rate reached 139.8% of the population in July 2007. The total number of mobile phone subscribers in the world was estimated at 2.14 billion in 2005. The subscriber count reached 2.7 billion by the end of 2006 according to Informa, and 3.3 billion by November 2007, thus reaching an equivalent of over half the planet’s population. What are its implications? Does your website content support mobile devices? Recently I tried browsing the Coconut Generation site over an iphone and realized that the flash based main page is not accessible easily, browsing is not easy. Watch out for the next version. Prepare exclusively mobile device strategy for dissemination of information, newsletter, soliciting donations, customer service, networking etc.